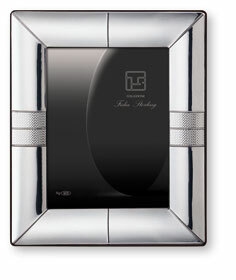 Beautifully crafted, and visually striking, our sterling silver photo frames come in a wide range of styles and sizes. The most skilled craftsmen and finest designers from Italy created our sterling silver frames and giftware. A special attention is given to every detail, creating a spectacular work of art that will last for generations. All of our sterling silver pieces are tarnish-free and each comes with its own certificate of authenticity. Reward Points 155 points will be rewarded to you when you buy this item.